We were walking near the third station, where Christ is said to have fallen while carrying his cross. There is a church, more than a thousand years old, that stands on the spot. We toured the chapel, and when we came out there was a group of Franciscans doing a re-enactment of Christ’s journey and carrying a cross. 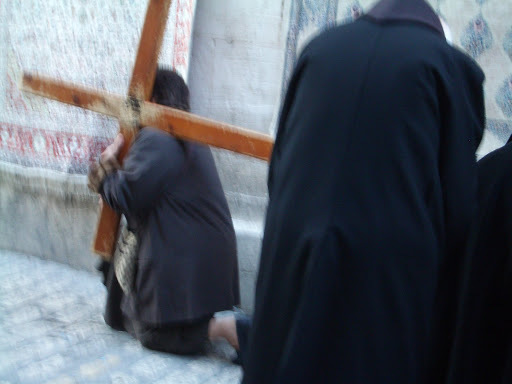 They carry it all along the Via Dolorosa, following the route that the Savior took. They stopped at every station and read from the accounts in the Gospels of Christ’s crucifixion, and they sang hymns in Latin. We followed them on their journey. That would have been a neat experience…I probably would have cried. Heck I am almost crying just thinking about the emotions that it would have brought me if I was really there.